A great article full of truthful evidence that common sense people recognize. Unfortunately, these incidents are used by those who wish to exert control over the law abiding populace. They use these incidents to create the hysteria necessary to drive through legislation necessary to exert the control and disarmament laws necessary. We each need to contact every legislator supporting additional gun control to voice our opinion . Today, I received an email from CD 2 Rep Joe Neguese , which touted the need for universal background checks, which already exist in Colorado , and that 34 people die each day due to gun violence. I emailed him that two thirds of that number are suicides, not homicides, and 80% of the remainder of the number are homicides by hardened career type criminals. I reprimanded him for using false statistics . I predict he will not correct his errors . Supreme Court has ruled Law Enforcement are under no legal obligation to protect any citizen. If cops are not required to confront shooters then why are we paying them? What good is LE other than to write traffic citations? Oh, that’s right they’re there to criminalize and fleece the law abiding into submission. My attorney says that at least 50% of 911 callers get cited for a criminal offense. I still can’t find language in the 2nd amendment that states one person has any right to take or prohibit another’s firearms over something possibly said. Quite the contrary in fact. Chickens get killed prior to being placed in freezer bags for the grocery store. Muslims are burning live animals to death in Denver, it’s on the news. Peloton says millions will die if she doesn’t get her way and Oprah says kill white people. Can turn on social media and death threats are rampantly stated. Broward County Sheriffs dept is on social media arming the mosque people telling them to carry concealed without a permit that it is their Constitutional right to do so. I believe everybody has the right to arms because it states this precisely in the Constitution. Words aren’t weapons. They can’t make an idiot stop saying stupid things because it is a right. If 30+ visits to a house rendered no citations/arrests then perhaps no crimes were committed therefore the taking of rights not justified by any measure. Pretty sure Florida might have a Red Flag gun grab law now for those who think they are the thought police. Ultimately if a credible threat was made and ignored look to who did the ignoring and look to who failed in response due to no requirement by law to protect citizens. I get angry listening to people that think they are entitled to take others possessions away for something stated or because they think they have rights to infringe upon another because it suits their agenda. I want you to go look up the words “inalienable rights” and explain to me how they are defined to taking of such? Broward cowards mistake was not preparing to protect citizens then also refusing to do. Perhaps they weee simply too busy arming up mosque attendees like the video of them doing so on social media. Perhaps somebody should investigate that and take action. The moral of the story is be armed and when a wacko tries to kill you blow the sob straight to hell. When I was a kid in Florida we all had guns and knew how to use them but liberals made guns sound bad and now kids are victims of liberal lunacy. Unarmed victims for the slaughter. Ted Nugent says one thing I like” when I arrive in gun free zones they cease to exist”. Amen to that brother! The solution to violence is not less guns IT IS MORE GUNS!!! THE FEAR OF GETTING BLOWN AWAY CURTAILS VIOLENCE. Not even by thought police or joe public because of words. Words don’t kill! Failure to provide personal safety for yourself is your own fault. There were no school shootings when we took our guns to school every day and hunted along the road going there both ways. Guns should be issued to every American by the government at a very early age if not born with them in hand to kill the abortionist vaccinators. And to go a step further beyond liberal interpretations of wording that does not exist please show me the words in the 2nd Amendment that require law abiding persons can only have this right. Show me, I’m waiting. Colorado restores full rights to those who committed a felony upon successful completion of sentance and Article 4, section 2 of US Constitution guarantees equal rights in a state to each citizen which does restore out of state felons rights that move here. Gov doesn’t want you to know these things because it interferes with their anti gun agenda. Continued liberal interpretation of these facts will keep the debate going on and on. One person thinking they have the right to infringe upon another’s inalienable right in a good lesson in futility. Go ahead and keep spinning in the liberalism, it is not survivable. 2nd Amendment is not a tool to disarm any person for any reason. It does not descriminate like most pro gun rights groups. It applies equally to all because the right to life comes from God not man nor pro rights group or gov. Man has no authority over who has this right to life because it is Gods will. 2nd Amendment lays the foundation for protecting ones life and it is disgraceful that people are yawing it as a tool to have gov disarm those who they fear because seeking protection from the gov is not what the 2nd Amendment is about by any means. Socialist society simply wants gov to protect them by taking guns and it is failed policy. None of you are God and not one of you has the right to infringe upon another’s rights for any reason. You gun lovers have them so use them on a nut job when you need to that is your 2nd Amendment right. Sissy’s that require the state to protect them and are willing to give up the rights of others (and their own by default) deserve neither. And to further clarify the facts Obama had a policy that LE were to not arrest or cite kids that were potentially dangerous for the purpose of promoting future manifestation of criminal behavior such as with the Parkland shooter. 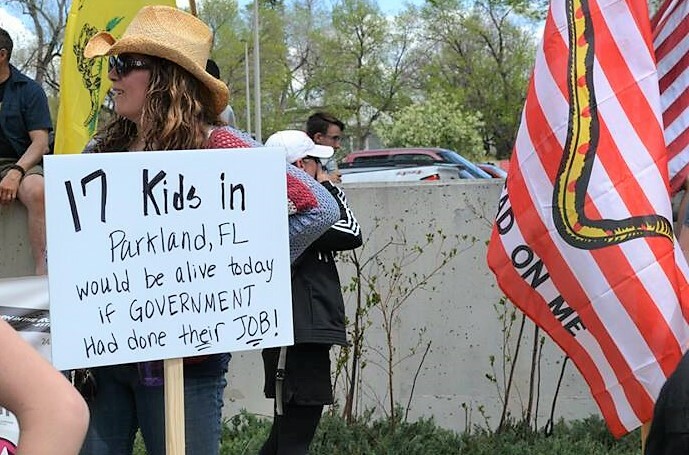 Kids like him were hands off to the cops protected by Obama to promote gun control. And look how good this Obama policy works, even the gun rights groups get on board and go after the gun when in fact Obama was complicit and walks away laughing because even the pro gun groups use the propaganda Obama produced to fuel the gun debate. Obama made this policy under the pretense that it was best to not give these kids a criminal record that could harm their future. But by all means go ahead and march on with the gun control confiscation rhetoric and help the gun grabbers fulfill their anti gun agenda while the real criminal walks away Scott free laughing because you drink his koolaid once again. It was about 16 years ago possibly when in Park County Colorado a girl was taken hostage at the local high school by a gun man. Her name was Emily. She was murdered that day at school while hundreds of Colorado cops were hiding out in the parking lot. No attempt to confront the gun man. No legal requirements to act. Emily got a nice parade. Cops in charge got medals for bravery. It’s disgusting how all sides use the propaganda while denying the real facts.